Description: this bipedal carnivore takes on a neutral posture, but this can be remedied since it sports a score of points of articulation not seen before on a JP dinosaur figure. For starters, there is the attack option: moving its right arm up and down causes the neck to swivel left and right (which can also be done without pushing the arm). Furthermore, the lower jaw and head itself can be posed downward, while the head can also swivel left and right. The arms can move up and down and rotate in a full circle thanks to ball joints. The legs can move back and forth, as can the feet: the latter too can rotate thanks to ball joints. On the right flank, a dino damage skin patch can be applied (or removed, depending on where you started): beneath it is found dark red muscle tissue and white ribs. To differentiate this Allosaurus from similar looking big carnivores like T-Rex, it is adorned with typical Allosaur traits: ridges are found above the eyes and nose, a line of feather like appendages runs over the back of the head and neck, and the back and the front half of the tail and various small horny nobs are found on its back. Such features give a rather rugged, savage look to this particular predator. This theropod sports a fairly colourful paint job. The dominant colour is blue, which can be found anywhere except on the top of the back and head and on its underside (lower part of the belly and tail, throat, hind parts of the arms, legs and feet) which are coloured beige instead. The top of the head and the facial ridges and various protrusions on the neck and back are covered brownish orange, while the spikes on the back are also blue. On the neck, back and front section of the tail, darker orange shapes are found in a symmetrical pattern with smaller white spots and stripes in their center. The front part of the feet sports the same dark orange colouring. Claws on both fingers and toes are painted black. The small eyes are red with yellow irises and black pupils. The creature has white teeth and a dark pink tongue, while a large white JP logo can be spotted on its right upper leg. Pitted against this Allosaurus is a human character named Ash Skullstriker. This muscular character too stands in a neutral pose but is fully poseable considering the ball jointed arms and legs and the extra articulation provided by the upper torso, head, knees and elbows, as well as rotatable hands and feet. Ash wears dark green pants, a black shirt and black boots and gloves. The pants sport an empty gun holster on the right leg and a big pocket on the left. This guy wears a brown vest around his torso covered with various pockets and even a grenade on the front: the vest appears to be removable, but is attached tighter than it seems, so removing it might damage it or the figure. Ash has dark grey hair and a goatee and eye brows in the same colour, while his white eyes carry black pupils. To top it all, he sports a black tattoo of an Allosaurus skull and two arrows underneath on his lower left arm. Ash comes with numerous weapons to defend himself against the Allosaurus. He has a black bow and arrow (attached to one another, so no separate arrow that can be fired) a small black gun that can fit in the aforementioned holster, and a brown pouch that carries a black double sword holder, with a pin on it that can be attached to Ash via the hole in his back. Two swords complete his arsenal, both silvery grey with black handles, a long one and a shorter one. 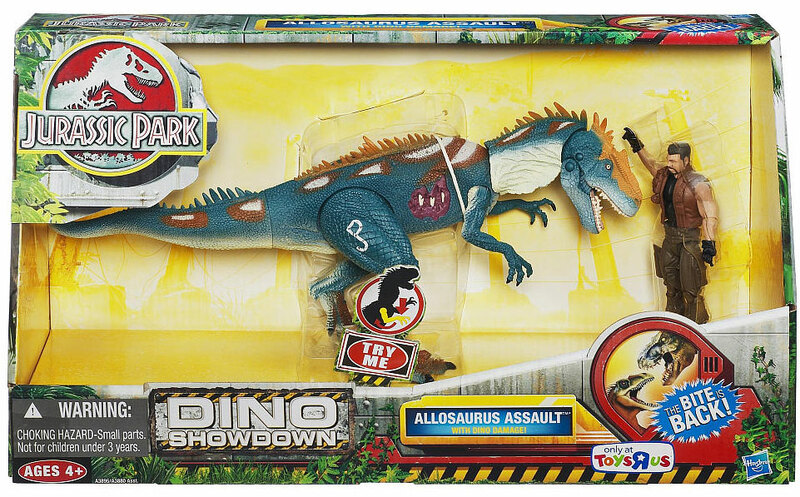 Analysis: we had to wait for good new sculpts for over a decade, but our patience was finally rewarded when the Dino Showdown packs hit TRU stores in 2013. The Allosaurus Assault was one of this pair, and by far the coolest set released by Hasbro since 2001! Prime attractor in this set is the medium sized Allosaurus, a ferocious looking predator with a number of poseable body parts not seen on any JP figure before, making it a definite break in style with the past and a good sign for future releases to come. However, the new is mixed with the old as indicated by the triumphant return of the age old removable dino damage wound! Fans had been clamouring for this particular action feature for many years – mainly because of Hasbro's fervorous fondness of having their dinosaur figures display large wounds that could not be covered up – and it appeared somebody was listening. The piece fits perfectly on the figure's flanks and sticks on pretty solidly, despite not being embedded into soft 'real feel' skin as on the classic Kenner figures, since this theropod is made mostly out of hard plastic instead. Apart from taking wounds the Allosaurus also can give them to antagonists with his head thrashing action, which also is not a new feature. It works less impressively, making the head and neck swivel a little left and right when the right arm is pulled. It looks better if the animal has prey between his jaws, in which case it appears to violently swing its victim around. Ash could sure fill the part of that victim. Like his prehistoric adversary, he is fully poseable and looks quite butch, definitely not someone to mess around with. However, his weapons carry no action features to back this up, they're mere accessories. They will not help him if the Allosaurus decides to make a snack out of him, grabbing hold of his body with its vicious jaws which can open surprisingly wide. Despite his tough appearance - and funky tattoo!- Ash really doesn't stand a chance against the creature, ready to have his own skull struck, but at least he looks cool when fully armed, reminiscent more of a G.I. Joe soldier than a JP figure, but that's no problem since dinosaurs don't really care much about aesthetic qualities in their food. Overall, this is a terrific new dinosaur figure, almost redeeming Hasbro for its lack of care over the last decade where the JP franchise is concerned. It looks cool, moves cool and bleeds cool. Like many recent Hasbro figures it has a colourful paintjob but not as ridiculous or excessive as on the JP 2009 repaints. Still, the white/beige could have been toned down a bit, but it's a minor complaint considering we got such a great new figure at all. Hopefully, Hasbro will continue travelling down the road they started with this Allosaurus (and its herbivorous counterpart, the Pachyrhinosaurus) and deliver similarly awesome dinosaurs instead of once again resorting to needless repainting. Playability: excellent. As stated before, the number of points of articulation on this dinosaur is greater than on any of its predecessors, making it one of the most poseable JP dinosaur figures to date. Especially nifty is the poseability of the head and lower jaw. Its head thrashing option by comparison is rather dull and uninspired, but works fine enough despite being connected to the right arm. The removable dino damage piece is a grand action feature as always. The only real downside to the Allosaurus is an issue of balance: it has an unfortunate tendency to tip over unless standing quite upright. It's also prone to paint wear: rough play will definitely not make this animal look more handsome. Its human companion Ash is also more poseable than any human figure before. However, his accessories sport no action features of their own other than being able to attach themselves to their owner. Too bad, Ash could have used a bow that can actually fire arrows to defend himself from the Allosaurus' eager teeth. Realism: pretty good actually. Of course no Allosaurus has yet been seen in a JP movie, and so it's not based on anything directly, but this release is a definite step-up from the only other Allosaurus from JP toy history, the one from the TLWS1 Medical Center set. It's roughly the same size, but sleeker, more bird like in design. It's definitely one of the more scientifically accurate JP toys yet released, representing a rather up-to-date look of this late Jurassic hunter. The typical Allosaur facial ridges are present, while the appendages on the neck and back are added to make it look more dastardly. Its size compared to the human figure it comes with is fairly close to the real deal. Overall, dinosaur toy fans may be reminded of the Papo Allosaurus, which could very well have been a genuine inspiration for this particular action figure. Overall rating: 9/10. An excellent new entry into JP toys lore and at the time a grand promise for the future, this Allosaurus is one of the best dinosaur figures released by Hasbro ever. It looks fabulous and quite accurate and is very poseable. Its action feature (and the lack of action features from Skullstriker's accessories) isn't particularly appealing, but the removable dino damage wound patch and overall design of the beastie make up for it in spades. This set was only released at Toys'R'Us in North America and as such can prove hard to find for enthusiasts in other territories, especially a couple of years down the road. However, it's well worth tracking down.